... 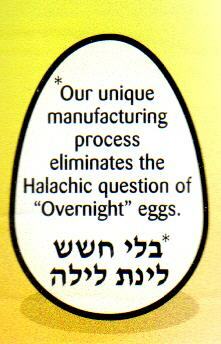 According to halacha* eggs should not be removed from their shells and left in that state overnight. The halacha also applies to onions and garlic. 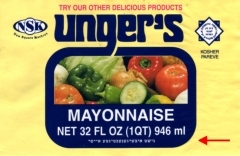 The Unger's Mayonnaise label bears the text line "no overnight eggs" written in Yiddish and rendered in Hebrew letters. Information logo on the label of a bottle of Elisha Mayonnaise, 950 grams, Belgium. Accompanying hechsher: Machsike Hadass, Antwerp, Belgium.